The tall, sand-colored granite pedestal stood out instead. Joan and the steed she rides are cast in dark bronze and shrouded by surrounding trees. Yet these obstructions, absent when the monument was unveiled more than a century ago, actually enhance the experience of contemplating this stately work of art. Curious first-time visitors like me are enticed into the knoll-like park, the overgrown branches and leaves heightening the intrigue about what exactly is perched atop the pedestal. We enter a relatively secluded setting — the most intimate I’ve encountered for a monument in the otherwise bustling city — which adds to its distinction. Jeanne La Pucelle, known to history as Joan of Arc (1411–1431), was a French peasant girl driven by alleged divine inspiration to expel the English from Orleans in 1429, and King Charles VII had her command a provisional army toward that mission. But the youthful warrior would ultimately burn at the stake after she was captured, sold to the English and charged with witchcraft and heresy, setting the stage for her status as a martyr. 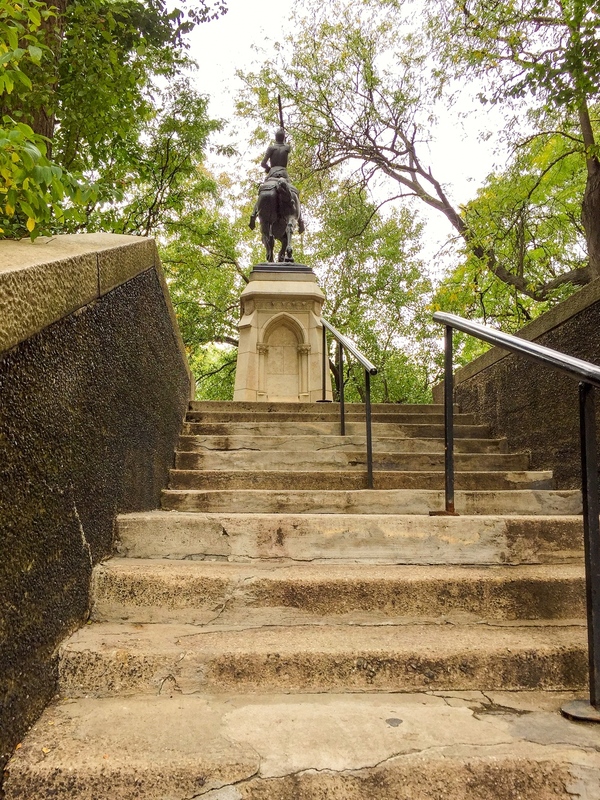 The sculpture in the park on Riverside Drive features an armor-clad Joan riding a trotting horse with animated eyes and flaring nostrils. She holds a sword aloft and looks heavenward while leading men into battle against the English. Joan’s sword, I learned from art writer Dianne Durante’s book Outdoor Monuments of Manhattan, is legendary. The divine voices she heard told her where to find that weapon once wielded by Charlemagne. 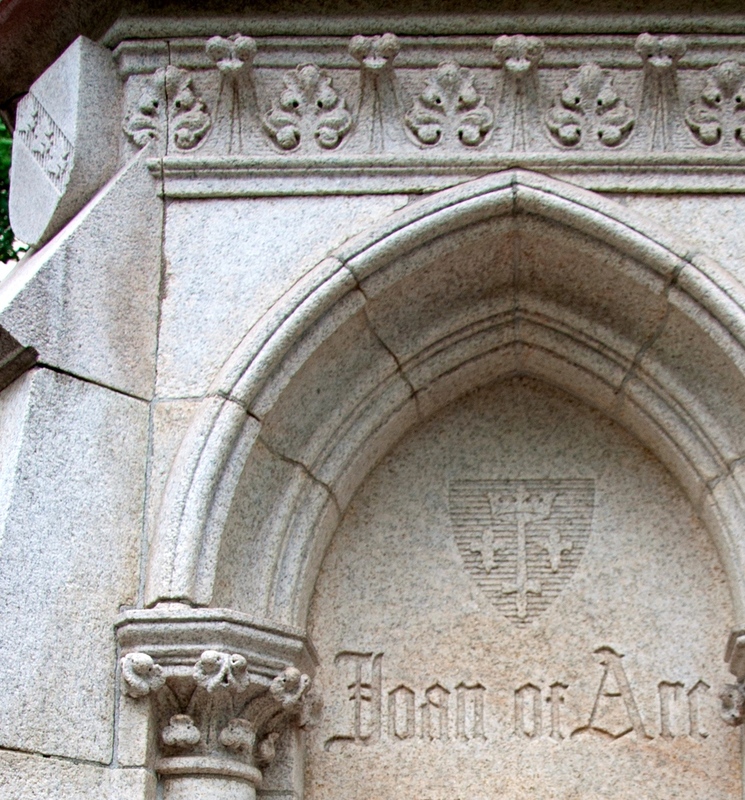 When I stepped onto the cobblestone that surrounds the 20-foot-tall monument, a closer look at the Mohegan granite pedestal revealed Gothic arches and coats of arms, evoking the medieval period when Joan battled the English. I had to drop my head back to get a better view of the sculpture. A semi-circular stone bench, though, invites visitors to step back, sit and contemplate the art. A set of concrete steps behind the monument, which align with 93rd Street, sets it further apart from an already quiet neighborhood. But Joan and her horse were not always so secluded. In 1909, a committee for a Joan of Arc monument formed in New York City. The committee awarded sculptor Anna Vaughn Hyatt Huntington (1876-1973) the commission and architect John van Pelt would design the pedestal that features some limestone blocks from a tower where Joan was imprisoned in Rouen, according to New York City Parks. The monument was unveiled at a ceremony on December 6, 1915. The creators of this monument clearly wanted the trees to become apart of the experience of visiting, observing and admiring this inspiring work of art, and they likely wanted to produce a distinct setting. If so, with time and growth, they got one.